Developed using the latest advancements in performance imaging, like our exotic EPSON PrecisionCore™ TFP® print head, EPSON REALOID image processing hardware, and our breakthrough pigment ink technology - EPSON UltraChrome® XD - the all-new SureColor T-Series could be the way you'll print your next big idea. Print speeds for a single page are based on print engine speed only. For D-size prints the T3270 prints slightly slower than the T5270 and T7270. Total throughput time for any print depends on workstation configuration, file size, print resolution, ink coverage, networking, etc. Scan speed of 6-inches per second based on scanning at 200 dpi in 24-bit RGB color. Copy speed based on time from start of copy process (360 dpi speed mode) until printing is completed including cutting of the paper. Sales Reference Guide for this product. 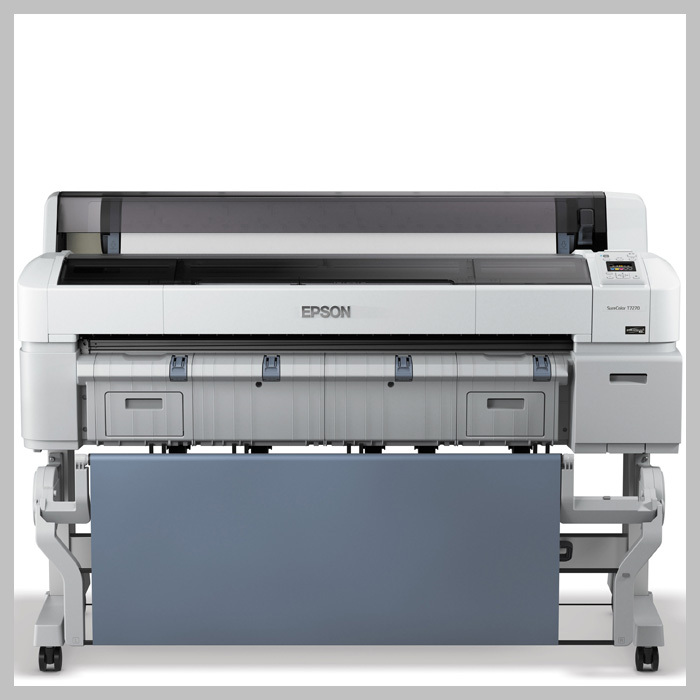 Optional Epson SureColor T-Series Extended service plans available for purchase. The printer is designed exclusively for use with Epson cartridges for greater reliability. Maximum roll diameter: Up to 5.9"
Minimum sheet size: 8.27" x 11"
SureColor T3270: 10", 11.8", 13", 16", 17", 20.3", 23", 24"
SureColor T5270 / T5270D: 10", 11.8", 13", 16", 17", 20.3", 23", 24", 29", 33", 36"
SureColor T7270 / T7270D: 10", 11.8", 13", 16", 17", 20.3", 23", 24", 29", 33", 36", 41", 44"
Top and bottom edges can be automatically cut to any length when printing on roll media. A: Print speeds are engine speeds only. Times shown for ANSI D-size page are based on page size 34" W x 22" L (SC-T3270 model is slightly slower at 28 seconds). Total throughput time depends on workstation configuration, file size, print resolution, ink coverage, networking, etc. B: Scan speed of 6-inches per second based on scanning at 200 dpi in 24-bit RGB color. C: Cartridge yields vary considerably based on images printed, print settings, paper type, frequency of use and temperature. For print quality, a variable amount of ink remains in the cartridge after the "replace cartridge" indicator comes on. The printer ships with full cartridges and part of the ink from the first cartridges is used for priming the printer. If you would like to visit our Epson T-Series overview page, please click this link. Purchase an Epson SureColor T3170 24 inch desktop printer and you will receive an instant rebate of $100.00 (our website price reflects this rebate). Purchase an Epson SureColor T5170 36 inch printer and you will receive an instant rebate of $100.00 (our website price reflects this rebate). Purchase an Epson SureColor T3470 24 inch printer and you will receive an instant rebate of $100.00 (our website price reflects this rebate). Purchase an Epson SureColor T5470 36 inch printer and you will receive an instant rebate of $100.00 (our website price reflects this rebate). Purchase an Epson SureColor T3270 24 inch printer and you will receive an instant rebate of $250.00 (our website price reflects this rebate). Purchase an Epson SureColor T3270SP 24 inch Screen Print Edition printer and you will receive an instant rebate of $250.00 (our website price reflects this rebate). Purchase an Epson SureColor T5270SR 36 inch printer and you will receive an instant rebate of $500.00 (our website price reflects this rebate). Purchase an Epson SureColor T5270DR 36 inch printer and you will receive an instant rebate of $1000.00 (our website price reflects this rebate). Purchase an Epson SureColor T7270SR 44 inch printer and you will receive an instant rebate of 1000.00 (our website price reflects this rebate). Purchase an Epson SureColor T7270DR 44 inch printer and you will receive an instant rebate of $1200.00 (our website price reflects this rebate). For a complete listing of eligible items for these offers, please click this link. Offers end on April 30, 2019, and are limited to stock on hand.